The Student Success Center (SSC) provides quality, student-centered academic support services to help students achieve success. The Student Success Center offers a testing center, tutoring and study groups, professional mentoring, athlete study table, placement testing, the University College Program, developmental coursework and disability support services. "Come visit us today!" - Success Coach Sr. Sarah Foster, Tommy Titan and the SSC Therapy Dog Bentley! Hours of Operation: Monday-Friday: 9 a.m.-5 p.m.
During finals week, hours are extended and testing is by appointment only. Call 313-993-1143 for more information. For more information on the CLEP/DSST (formerly DANTES), please visit the Registrar website. SSC offers free tutoring in most freshman and some upper-division courses, including math, chemistry, biology, languages, philosophy, history and English. One-on-one and small group appointments are available in the Student Success Center on the third floor of the McNichols Campus Library. Make your appointment with a tutor today at udmercy.accudemia.net. Limited walk-ins are available. 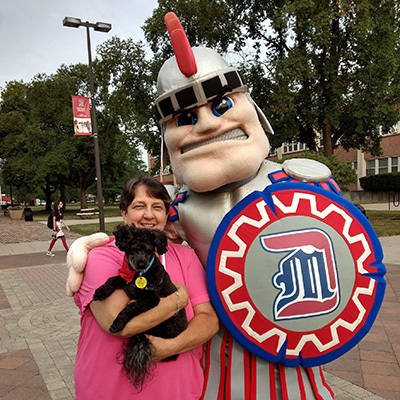 Detroit Mercy also offers study groups, conducted by tutors who sit in on specific sections of targeted courses throughout the term and run study sessions weekly. These guided study groups support freshman math, science and statistics classes. The SSC provides professional mentoring for all undergraduate students. Mentors meet with students on a weekly basis to provide academic success coaching and connect them with resources here on campus. Testing in English, math, chemistry, computers, foreign languages and reading is available in the Learning Center by appointment for all new and applicable transfer students. The results of the placement tests are given to the student's advisor to assist in proper course selection. Click here for more about Detroit Mercy's math placement recommendation. Click here for more on placement testing. The University College Program offers extensive support services, developmental advising and peer mentoring to conditionally admitted students. Students are admitted to the program through a selection and interview process. A condition of admission is the signing of a program participation contract. Click here for more on the AIME Program. SSC is home to the State of Michigan grant-funded program King-Chavez-Parks Initiative. Program highlights include professional mentoring, academic success coaching and various programs and events. Click here for more on the KCP program. Student Disability & Accessibility Support Services are available to all currently enrolled students who have documented disabilities that substantially limit them in one or more major life activities.